Almost a year ago, a new and innovative project was published on Kickstarter. Expecting to make only a couple thousand watches at most, Pebble was completely unaware of the impact their product would make in the coming months. Ten million dollars later, the Pebble smart watch shattered Kickstarter’s record for the most money funded for a project and had the task of coordinating the design and manufacturing of over 80,000 watches to some 65,000 Kickstarter backers around the world. Despite selling out of the watch on the crowd funding website, Pebble’s success was reinforced when they continued to sell pre-orders on their website. 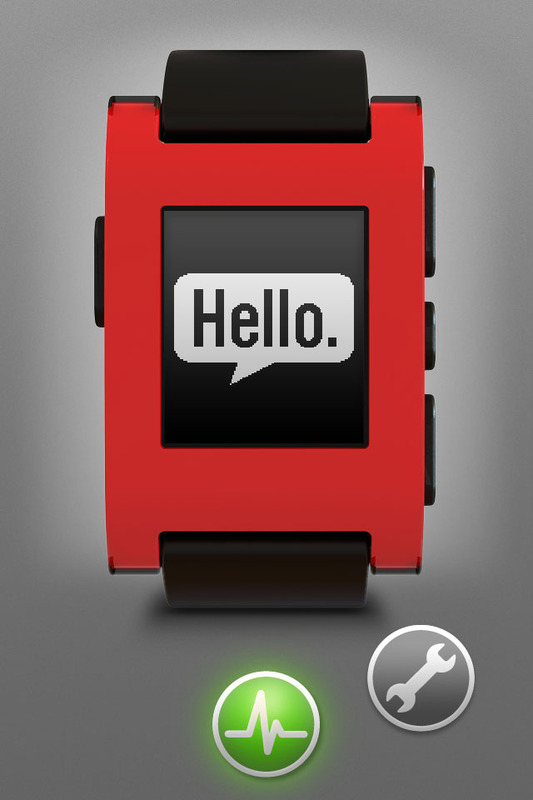 At the beginning of January 2013 at CES, Pebble announced they would begin shipping watches to their backers. The end to the long road of fulfilling Kickstarter rewards was in sight. Due to the sheer volume of watches that needed to be produced, Kickstarter backers are still receiving their pledge rewards as of today. In fact, to my knowledge, only the black watches have been shipped so far due to the overwhelming demand of that particular color– there are still three other colors of watches waiting to be produced. I received my Pebble watch today– something known as “Pebble Time”, or #PebbleTime on Twitter, by Kickstarter backers– and immediately put the watch through its paces. I’ve been told the packaging is similar to that of the Amazon Kindle– a basic cardboard box with some branding, and a removable “zipper” that causes it to open. Once the zipper is opened, the box cannot be resealed. 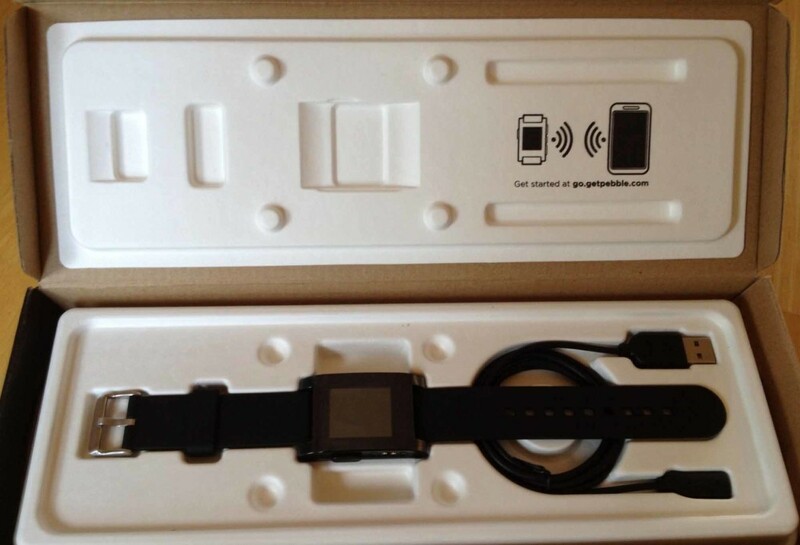 Inside the box, there are really only two pieces of hardware– the watch itself, and the magnetic charging cord. Upon turning the watch on, it’s obvious how good the display is. In the sunlight, the bistable LCD display looks amazing. It is worth noting that the LCD on the Pebble is not E-Ink (which is a specific, proprietary type of E-Paper used in the Amazon Kindle). Rather, it is a black and white zero-power LCD that behaves similarly to E-Ink, but without the annoying “flash” when the screen refreshes. In fact, the LCD used on the Pebble is capable of full animations, which the software makes gratuitous use of. It’s quite impressive to see the LCD while animating in the sunlight: the contrast is fantastic and it looks surreal in motion. The resolution of the screen is 144×168. In a day and age where every new mobile phone screen is of “retina” quality, the pixels are certainly noticeable, though not distracting. Because the screen is black and white and has no intermediate shades of gray, you’ll see a dithering effect in some areas of the UI that are used to simulate varying levels of opacity. It’s reminiscent of the Apple Newton days, and the UI makes fantastic use of the screen’s capabilities (or lack thereof, depending on how you think of it). The backlight is relatively bright– but not overwhelmingly so–and is perfect for when you’re in dark. The ambient light sensor should theoretically prevent the backlight from activating needlessly and draining your battery. Another area of importance is the physical buttons on the side of the device. There are four in total– three on the right, one on the left. They provide a bit of resistance, but there’s a small “click” of feedback that can be felt. I wouldn’t be worried about them wearing out or being accidentally pressed when your hands are in your pockets or moving around. Also on the left side of the watch is the magnetic charging contacts. Like the Macbook Air and Macbook Pro laptops from Apple, there is a magnet inside of the charging cable head that snaps the cord into place on the watch with a satisfying “click”. The magnet isn’t very strong and won’t even hold its own weight when hanging off the watch, but it works fine for guiding the cable into the correct place. Overall, this is a great feature of Pebble as it allows the watch to be waterproof up to 5 ATM. The battery is stated to last up to a week, and while many backers are complaining of short battery lives, Pebble has stated they are working on it. Around the back of the watch are the words “Kickstarter Edition” along with an engraved “pebble” logo. You’ll also find your serial number and the requisite FCC markings, along with an indicator of 5 ATM of water resistance. The black watch strap itself is nothing to write home about. It’s pretty standard looking with a silver metal clasp, but the band itself is relatively stiff compared to other watches I’ve worn, making it slightly more difficult to take the watch off. The good news is, the strap is replacable. The body of the Pebble is made of plastic and is extremely light compared to more traditional watches made of metal. There’s no rattling of loose parts or buttons when shaking the device, which is good because you’ll find yourself shaking your wrist often to turn on the backlight. The plastic doesn’t feel cheap, but it certainly is not something I’d be comfortable banging on a granite kitchen counter for fear of cracking the display lens or body. The first thing you must do when you switch the watch on is pair it with an Android or iOS device (usually your smartphone). As far as I can tell, there is no way to use the Pebble without one. To begin, you are instructed to go into your Bluetooth settings and pair the watch with your phone. 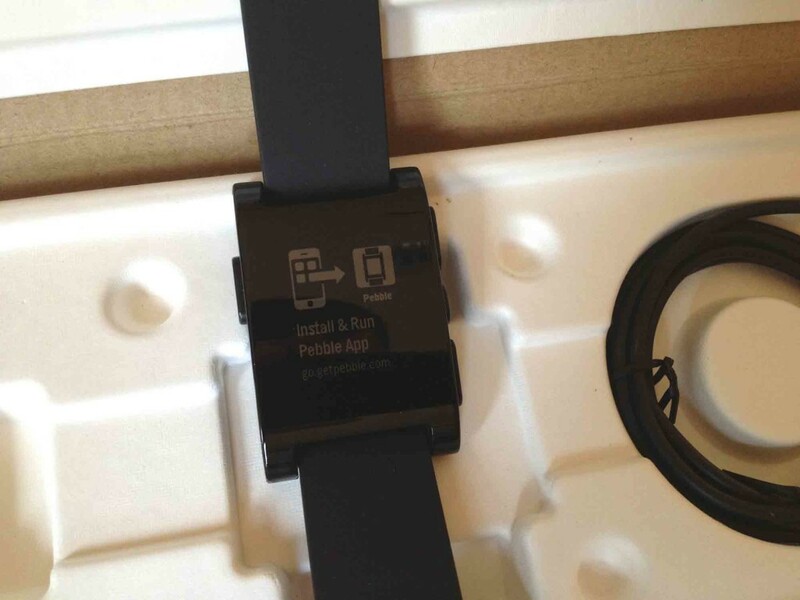 After it’s been paired, you will need to download the Pebble app from the Apple App Store or Google Play. The Pebble app on the iPhone, while usable, is slightly confusing due to its use of ambiguous icons, menus, and gestures. Tapping the icon that looks like an EKG wave takes you to a screen with diagnostic information about your watch, such as its name (which is based on your serial number) and connection status. Tapping the name of the watch will result in your Pebble vibrating and indicating “Ping Received” on its display, which is useful for testing connectivity of your watch. If an update is available, you’ll also see it in this diagnostic screen. After pairing your watch, updating it to the latest edition of the operating system is critical. There’s bug fixes and new features in more recent versions of the software, plus fixes for a rare issue where the Pebble would actually become bricked. I had some issues updating the watch initially where my phone would indicate the update failed and needed to be retried. Eventually, the update went through and took a little over a minute to apply to the watch. After the watch rebooted (which is a little bit odd to think about, considering watches are traditionally not thought about as computers), I proceeded to install new watch faces from the watch app store. Inside the Pebble app on your phone, you’ll find the watch face selection screen behind the wrench icon. Above the button titled “Select watch faces” is a list of the watch faces currently installed on your Pebble (it’ll be empty when you first receive your watch). Tapping the green button opens a new menu with a list of available apps and watch faces, along with screenshots, their names, and the developers’ names. I installed 91 Dub, Simplicity, Brains, and Snake Finn initially. One cool feature about the Pebble is the ability to have multiple apps installed on the watch– you don’t have to ever pull out your phone to switch watch faces (except when adding new ones). The most recent major version of the Pebble operating system, version 1.9, changed the way you navigate through the UI. Previously, watch faces were listed in the main menu with other apps such as Music and Settings, however they are now considered to be the “bottom” of the navigation stack. Essentially, this means if you keep hitting the back button (the button on the left hand side of the watch) you will eventually see the watch faces. The up and down buttons on the right then navigate through all of the watch faces installed on the device. Personally, I find this navigation more intuitive– it’s always easy to find your way back to a watch face without going through menus. Hitting the middle button on the right hand side of the watch, which acts as a select or enter button, will take you to the main menu. Right now, the only options on the Pebble are to control your music, set an alarm, see all watch faces installed on your device, and go into the settings. The word “only” doesn’t seem quite appropriate, because in reality, it is quite a few menu items for you to choose from considering the Pebble is a watch. There is a limited selection of watch faces in the watch App Store, though this will change after the SDK is released later in April. Currently, the available watch faces and apps are displayed in a single scrolling list within the Pebble app on your phone, which will become problematic once there are more watch faces to choose from. Oddly, though the Settings app allows you to select 12 or 24 hour time formats, individual downloaded watch faces do not respect this setting. 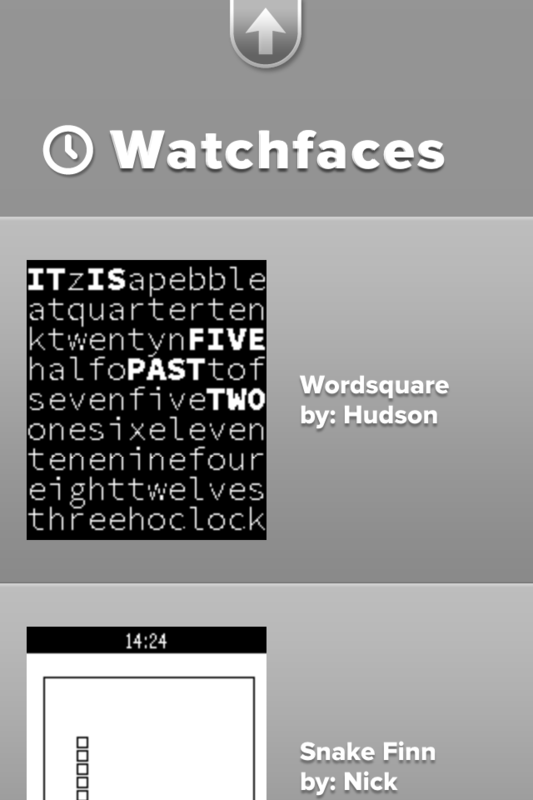 In fact, some watch faces have two individual versions in the watch face store– one for each time format. Hopefully this will be resolved in a future software update and developers will be able to display one time format or the other based on a Pebble user’s settings without having two different apps. Android users have some additional notifications not present on iOS, though the same is true in reverse. Jailbroken iPhone users can install a tweak called “BTNotificationEnabler” to push all notifications to your watch, including Twitter, Facebook, Mailbox, Spotify, or any other app that works with notification center. Once you receive a notification, you can easily dismiss it by pressing the back button. Alternatively, you can leave the Pebble alone for a few minutes and the notification will slide away by itself. The vibrating motor that triggers when you receive a notification is relatively powerful and is easy to feel. It does make a little bit of a rumbling noise, but it won’t be noticable in most situations. The one issue I have with the vibrating motor is at night– if your Pebble is on your desk, you will probably hear it. The vibration isn’t muffled like your typical iPhone or Android device– it’s pretty loud and cuts through the silence. Whether you wake up or not depends on if you are a light sleeper. The backlight can be activated in a couple of ways– by flicking your wrist, or pressing a button. There is an ambient light sensor, and I’m guessing the device intelligently guesses whether to enable the backlight or not depending on your surroundings. Flicking your wrist to enable the backlight is intutive and a conventient gesture to have. There seems to be onyl a few cases where the backlight “misfires” due to putting my hand down on a table, but otherwise it’s pretty good at detecting when I actually want the backlight to turn on. It’s really difficult to call the Pebble a watch. Not only does it communicate with your smartphone, but it has an operating system of its own and can run standalone apps (Snake!). Pebble can be a fitness instrument, a navigation tool, and so much more. The SDK, which will be released later in April, will open the platform to developers worldwide and spark a new generation of apps– those that are always on and visible at a glance of your watch. The hardware is refined and feels great, despite being plastic, which important because it cannot be changed at a later date. While the software needs some improvement in areas, Pebble is slowly becoming better over time thanks to the software updates. This is the killer feature of Pebble– your watch is never static because data and software can flow to and from it. Pebble, in my opinion, has defined a new genre of wearable devices. It was only after the Pebble’s success did other companies begin to express significant interest (at least, have rumored to be interested) in creating smartwatches. 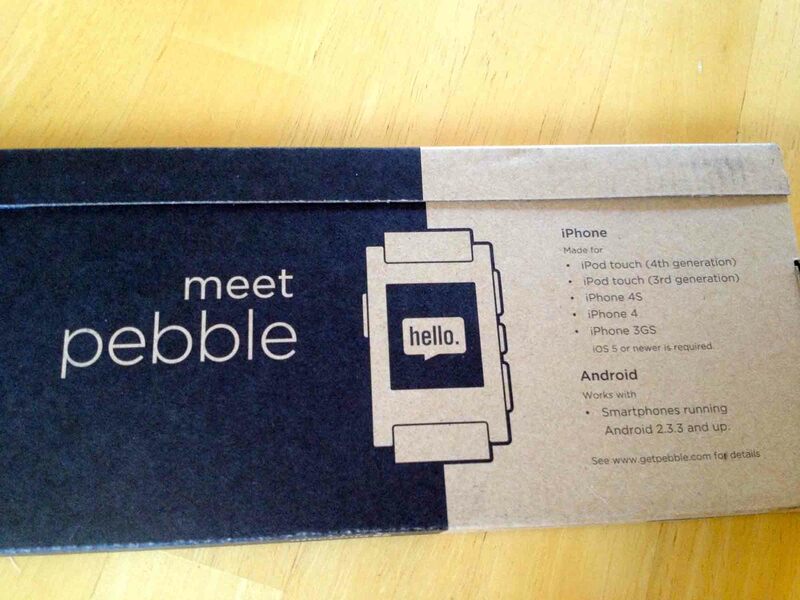 As the year goes on, it will be interesting to see larger companies try and create an experience as refined as Pebble. Some will likely succeed or even surpass the Pebble, but others may take the path of the MotoActiv and fade into relative obscurity. Until then, the Pebble is a fantastic device to augment your phone, and a product every one of the Kickstarter backers should be looking forward to receiving.